b) that subset of those reactions that constitutes metabolism must deliver enough energy to give organisms the extra resources needed to develop intelligence, that is to go beyond merely growing and reproducing. Silicon life might not look like animated crystals, as in this drawing from Dickinson and Schaller. Structural elements could well be in threads, like fiberglass, connected by tensor elements to create flexible, delicate, possibly even filmy structures. and new atoms or compounds must be easily able to enter into the process. In gases the molecules are too widely separated or impacts are too energetic, and in solids they are too constrained. Thus, the chemical reactions essential to life probably have to take place in a liquid, whether that is water or some other solvent. Water is a polar solvent, that is, there is a slight difference in electrical charge at the two ends of the molecule. Water is therefore able to dissolve polar compounds, like sugar, salt, proteins, and nucleic acids. Our chemistry reflects this in that proteins and DNA primarily undergo reactions, whereas nonpolar lipids (fats and oils) act as insoluble membranes to provide protected environments for reactions. If the solvent is nonpolar, the situation would be reversed: lipids would float in solution and would have to perform the same functions as our proteins do, and proteins would be insoluble. Life is so complex that it seems miraculous it could appear at all, to say nothing of appear under extreme conditions. In recent decades, life-as-we-DO-know-it has been found in far hotter, colder, or denser environments than we thought possible. It has been found in rocks 600 meters underground, in Antarctic ice, and inside the boiling, radioactive water of nuclear reactor vessels. It has become harder, not easier, to imagine limits to the adaptability of life. Intelligence could develop in any of these potential forms of life IF the reactions involved provide enough energy, as discussed in the Metabolism section below. Given the adaptability of familiar life, who is to say what the limits of unfamiliar life might be? One of the easiest-to-read introductions to the topic of physics, chemistry, and life is Asimov's View from a Height. Although dated at this point, the laws of chemistry have not changed and many of his points are still valid. Table summarizing some alternative chemistries, with water-carbon chemistry included as a reference point. an over-reactive atom at our temperatures, e. g. fluorine? methane nonpolar -183 - -161°C fluorine? fluorocarbons? Metabolism is the term for a series of chemical reactions that provide energy in a form the organism can use for its own purposes: repairing cells, excreting wastes, making new cells, and reproducing. In over-simplified terms, the energy comes from an electron that is donated at the beginning of the process and accepted by another atom at the end of the process. Anaerobic metabolism uses a variety electron acceptors, but not oxygen. Aerobic metabolism uses oxygen as the electron acceptor. Metabolisms whose end-products are ethanol and lactic acid are used by yeasts and are also caled fermentation. Our cells use primarily aerobic metabolism, but are capable of falling back on lactic acid metabolism when necessary. When the body needs to rely on anaerobic metabolism to the point where lactic acid builds up faster than it can be carried away, the acid builds up and causes sore muscles. This happens when muscles receive too little oxygen for the amount of work they have to do. Bacteria have the widest diversity of metabolic systems, and among them, the most diversity is found in the oldest bacteria, the Archaebacteria. That implies there was considerable "experimentation" with this most basic aspect of life in the anaerobic (oxygen-poor) environment of early Earth. Some of these bacteria survive to this day in what are now extreme environments where oxygen is unavailable, such as the extremely saline muds of some salt marshes. The most relevant point is that anaerobic metabolisms produce significantly less energy than the aerobic kind. The energy-providing reactions are not generally very tightly controlled in anaerobic metabolism. They take place floating free in solution inside the cell. All anaerobic organisms are single-celled, whether they are bacteria or more complex cells such as yeasts. Multicellularity takes more energy than unicellularity because of the added energy needed to transport materials around the organism, among other things. If anaerobic metabolism does not provide enough extra energy to allow multicellular organisms to develop, it is difficult to see how it is going to provide the even larger quantities of energy needed for intelligence to develop. To get an idea of how much more energy aerobic metabolism provides, consider the outcome. The molecule that provides energy inside cells is ATP (adenosine triphosphate), which breaks a bond to become ADP (adenosine diphosphate). It then takes more energy from outside (i.e. from electrons cascading down their chain, see diagram below) to rebuild it back to ATP. Anaerobic sugar metabolism, as found in yeast, can make two ATPs from ADPs using the chemical energy in one glucose molecule. Aerobic sugar metabolism, such as humans and all other multicellular organisms on Earth have, produces 36 ATPs from one glucose molecule. Imagine having to live, to say nothing of think, on about one eighteenth of your usual energy. Even multicellularity costs too much at that level. The central element of aerobic metabolism, and the reason it provides so much more energy, is a series of reactions in which an electron bounces down a chain of molecules until it reaches a final electron acceptor that is then excreted. It is similar to water falling onto a mill wheel, except that chemical rather than gravitational energy is involved. In aerobic metabolism, hydrogen is the electron donor at the beginning of the process, and oxygen is the electron acceptor at the end. The process is closely controlled by proteins embedded in membranes. The figure shows a slice through the membrane of a mitochondrion within a cell. Mitochondria are organelles that produce energy (=generate ATP from ADP) aerobically. The red arrows follow the cascading electron. Then comes the ATP energy-generating part: All the protons (H+ ) that have been pumped outside the membrane create a gradient, just like accumulating water behind a dam. The protons "fall" back toward the inside of the mitochondrion through special channels (keyhole-shaped membrane structure at lower center). 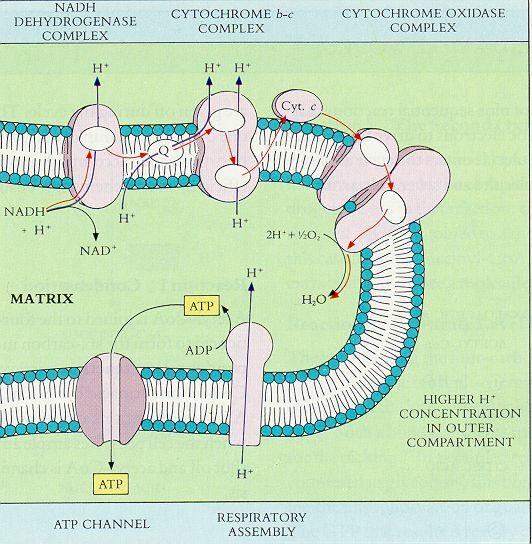 Each proton passing through the channel provides enough energy to make one ATP out of a depleted ADP. Ultimately, the ATP passes out of the mitochondrion through special channels big enough to accommodate the big molecule and into the rest of the cell where its energy is used and it turns back into ADP. Variations in basic chemistry and metabolism are based on the relatively small molecules of life. But the big macromolecules, the DNA, proteins, carbohydrates, phospholipids, glycosides, and so on, fundamentally structure the biology of the organisms dependent on them. We have only one model of biochemistry, the one evident on Earth, which makes it difficult to understand the specific influence of any one aspect of biochemistry. Science fiction, which has helped expand thinking on what forms life might take under alternate gravities and chemistries, is much less prolific on this subject. The tendency is to assume that substituting one type of protein for another would be much like using concrete blocks instead of bricks to make a building. The material is different, but the resulting structure is functionally the same. This assumption may be justified. More likely, as we understand the structural and other implications of different macromolecular conformations, it will turn out that different macromolecules result in different cell structures and physiologies. That, in turn, would result in very differently structured organisms. This topic has received less attention than some of the other ones in this unit, so the Assignment focuses on a macromolecular question. Oxygen is toxic to all organisms, including the aerobic ones that depend on it, because of its extreme chemical reactivity. When oxygen escapes that control it can form damaging compounds that are sometimes in the news and are known as free ___________. Assignment: Joan Slonczewski's The Children Star depicts a world that is strange from a molecular standpoint. The dominant life forms are prokaryotic, that is, like the bacteria on our world. What adaptations do the prokaryotes have to either increase the energy yield of their metabolism or to compensate for low energy? The genetic material is DNA, but it is in triple helices, not double-stranded like ours. How would this affect DNA replication? What would the implications be for the speed of cell replication and hence growth on this world? The amino acids that make up the proteins are different. On Earth, amino acids that are not normally found in proteins may be toxic, indigestible, or harmless. Prokaryon's biomolecules are toxic to humans, but humans can be genetically engineered to tolerate them. What is the likeliest form of this genetic engineering? Enabling humans to use the amino acids, i.e. altering our biochemistry? Making human membranes impervious to them? Engineering enzymes capable of neutralizing them? Some other solution? What are the pros and cons of different solutions?